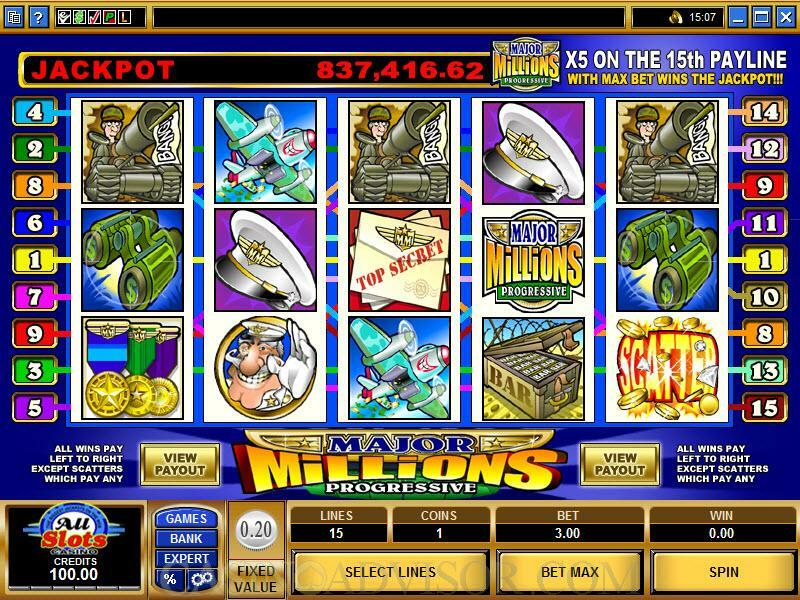 Major Millions is a progressive jackpot slot game designed by Microgaming, the most respected company in the online casino software business. This is a five-reel, 15-coin game with 15 paylines where the maximum wager is 300 coins. 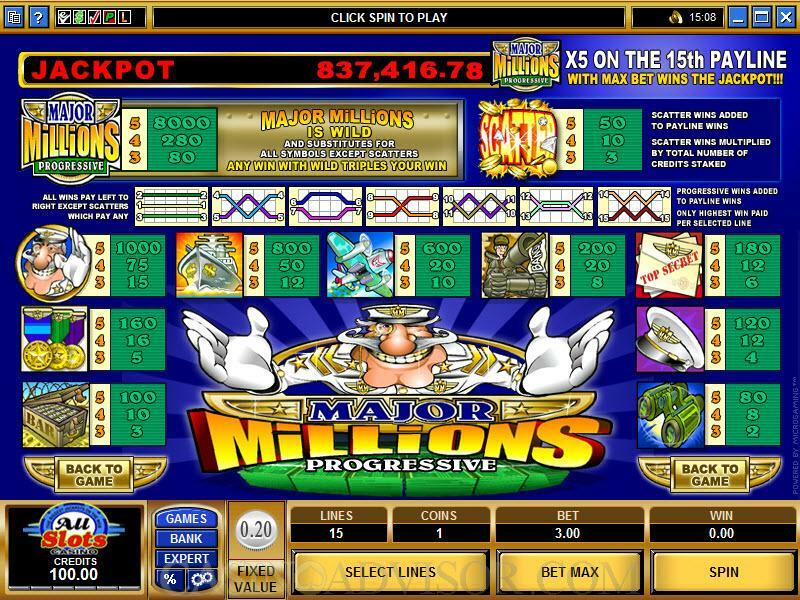 Major Millions features a wild (which also serves as a multiplier) as well as a scatter, which does not have to be on an enabled payline in order to be part of a winner. 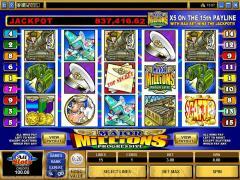 This is a five-reel game, and it is linked up with the three-reel version of Major Millions to produce a combined jackpot. In Major Millions, you can play in either Regular Mode or Expert Mode. The Expert Mode features AutoPlay, which allows you to play the game without having to actually interact with the casino software. Sounds (game, background and win) are completely customizable, so you can turn them all off if you really want to. 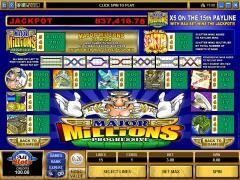 The Major Millions progressive slot game has a scatter, the Scatter Explosion symbol, which can show up anywhere on the five reels to complete winning scatter combinations as long as three or more of them show up on the five reels. Major Millions also has a wild symbol, the Major Millions symbol. A wild symbol serves as a substitute to complete winning combinations for everything but scatter symbols. Any combination made with the assistance of the Major Millions symbol triples the value of that win. Major Millions, as mentioned, has 15 paylines. When five Major Millions symbols (wilds) appear an any enabled payline from Payline #1 to Payline #14, the payout is 8000 coins. When five Major Millions symbols appear on the 15th payline, it instantly wins the progressive jackpot, which starts at $250,000 and has averaged in the neighborhood of $400,000. In Major Millions, there is one coin size and one size only - 0.20. With 15 paylines, the maximum bet is 300 coins. That can be accomplished with one click of the "Bet Max" button. A very quick and important note - you have to have a bet of fifteen coins per spin to be eligible for the progressive jackpot. Interested in reading more detailed information about Major Millions? If so Click Here for more details.